If you’re putting up signs in your company’s parking lot, or if you replace signs for your city, county highway department, or state DOT, Northwest Pipes POZ-LOC System is for you. Republic Sign Support Systems offers a comprehensive product line of Northwest Pipe Telescopic Tubing, an engineered four-sided tubing system that carries a heavy load. Engineered specifically for sign support — and perfected with the input of traffic-control professionals –Northwest Pipe Companies POZ-LOC System is the most cost effective and best performing sign support system on the market! 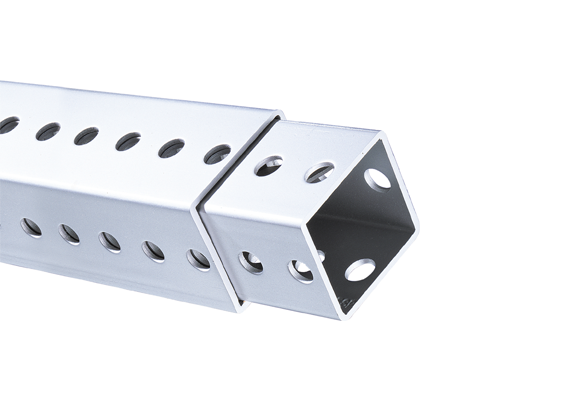 The POZ-LOC perforated sections are available in eight sizes ranging from 1-½” to 2-½” square. Perforated sections feature holes on all four sides, spaced on one-inch centers. Hole patterns may be special ordered to meet your specific needs, and sections without holes are also available. A unique corner weld produces close tolerances for easy adjustability and design flexibility, without costly on-site fabrication. POZ-LOC is available in galvanized and plain finishes, and is fabricated in 10, 12 and 14 gauge steel. With a complete line of fittings, fasteners and accessories, POZ-LOC allows for the construction of sign support without special welding, tools or assembly skills. To learn more, place an order, or just have a question answered, call us today! No amount is too big, no size is too odd … Republic Sign Support Systems is your one resource for Northwest Pipe Telescopic Tubing and related accessories. We have the professionals to get your order delivered to you accurately and fast, and trained specialists to support product inquiries. Precision manufactured from the highest-quality steel, POZ-LOC posts are corner-welded to allow smooth telescoping action — a key to the system’s versatility and ease of installation. Hate the hassle of cutting posts to meet job specifications? We’ll do it for you – free – so you’ll be ready to begin installation upon delivery! You’ll never have to worry about product availability because we stock a massive quantity of inventory in our warehouse. Our commitment to customer service will exceed your expectations. Our courteous, knowledgeable customer support staff is conveniently available 24-hours per day. We’ll expedite your order quickly and deliver right to you! 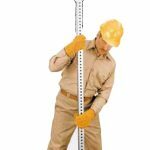 POZ-LOC 12 and 14 gauge signposts are available in sizes ranging from 1″ to 2-1/2″ square. Two 10 gauge posts – 2-3/16″ and 2-1/2″ square – meet extra heavy-duty requirements. Northwest Pipe Companies square posts with 7/16″ prepunched holes on 1″ centers are the standard against which all other signposts are measured. Hole patterns may be special ordered to meet your specific needs, and sections without holes are also available. POZ-LOC posts are cold-formed from carbon steel on state-of-the-art high-speed rolling mills. Steel is pregalvanized, then coated with a conversion coating and sealed with an acrylic topcoat during manufacturing. The result is POZ-LOC, a finish providing exceptional levels of long-term appearance and corrosion protection. To learn more, place an order, or just have a question answered, call us at 563-322-6204.